For the past week Hester Berry has been artist in residence for the National Trust, at the Cabin in Bucks Mills. We aked Hester what has it been like living so simply, just as the original owners did so many years ago. We were interested in how she has spent her time there and were delighted when she included images of her work. The tiny little stone building was a live-in studio for artists Judith Ackland and Mary Stella Edwards, from 1920 – 1971. Although there is no electricity or water, the studio is light and cheery, and affords wonderful views over the sea, to Hartland, Lundy, and Baggy Point. I have been exploring the beach and the coast paths, sketching, making my own paints, and trying to recreate a sense of the dramatic light on the cliffs and beach. It’s a wonderfully inspiring place, so rich in history. 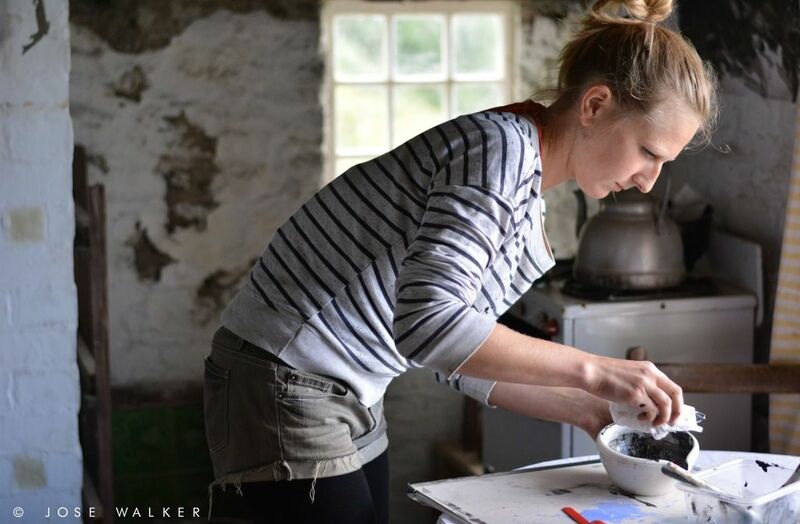 You can discover more about Hester and her open days at the cabin in this article. I so admire your energy producing materials, art and trekking about in this fantastic place – I look forward to seeing more of your work in September. Thank you Christina!! Hopefully see you at the Open Studios! We have visited this lovely spot & seen the inside of the cabin. People forget that many of us lived without electricity or running water in the 1940’s and early 50’s. It’s great isn’t it? Had a lovely time there. I can imagine it felt very isolated 60 years ago. I so regret not getting over to see you even though I go when I can to Bucks Mills. It’s a dream to be in residence there. So inspiring. I hope you had an incredibly rewarding time there,… how could you not?! Hope to get to Swimbridge during AT. It might seem as though The Cabin at Bucks Mills would be very isolated years ago, but remember that the lime kiln would have been operating and boats coming and going as the quay would have been functioning. So it might be more apt to think of how busy it would have been – it’s only with our take on things these days we think of how hard it was living then, but anyone living there then wouldn’t have known any different. Very true Stella, and we can apply this general philosophy to so many things in modern life. Our parents coped perfectly well without mobile phones and all the other techno-wizardry that has become so essential today. I, for one, don’t think it makes life easier, it seems to make it more complicated and distance people from one another!